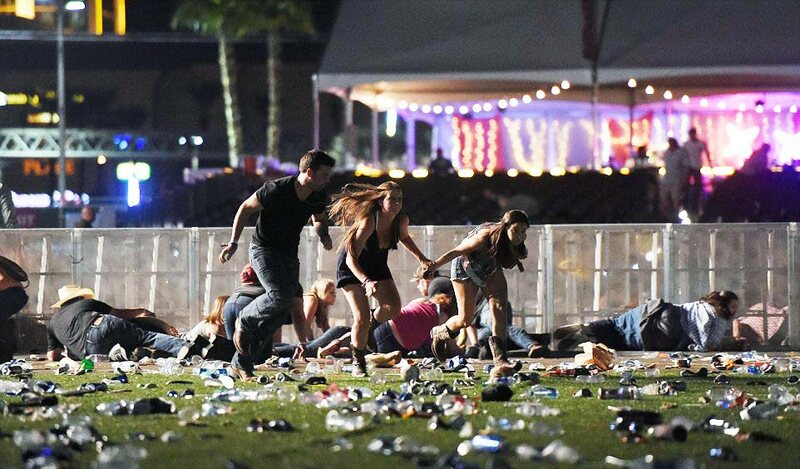 TAKING COVER: People run for their lives as shots are fired at an open air concert in Las Vegas Sunday night, leaving 58 dead and many hundreds injured. An uneasy silence fell over the city of Las Vegas, Nevada yesterday in the wake of Sunday’s deadly shooting at a music festival outside the Mandalay Bay Hotel and Casino, Trini-born businesswoman Kamika Conway revealed yesterday. Conway, who has lived and worked in Las Vegas for the past 18 years, described the scene on Sunday evening saying she was at work at 10 pm, when she and staff heard rapid gunfire. “It was a truly terrifying experience, from where we were we had a good vantage point of the shooting as it unfolded. We saw people running and taking cover,” Conway said. Conway said her mother and sisters tried contacting her several times as reports of the shooting began making international headlines. She said that at the moment, both state and federal law enforcement officials were still at the scene as investigations continued. Up press time, several businesses in and around the shooting scene remained closed. Newsday also spoke to another Trini who is on vacation in Sin City, who asked only to be identified as Alyssa, and she too recalled a feeling of terror and helplessness as the shooting started. “We were in the hotel next to the one that the gunman was in when he began shooting. We got out of our cab and while walking to the check-in line, we saw people crying and running in. That’s when we heard there was an active shooter. The concert goers ran to our hotel for safety,” Alyssa said. According to reports, 64-year-old Nevada resident Stephen Paddock, opened fire with an AR-15 assault rifle from the perch on the 32nd floor of the hotel, overlooking the outdoor Country Music Festival. He killed at 58 people. Paddock killed himself as officers began to storm his room. At least 10 firearms were found in the room by officers. Newsday attempted to contact the Office of the Minister of Foreign Affairs to determine whether Trinidadians in Las Vegas were accounted for, but were unsuccessful. Reply to "Trinis safe in Sin City"